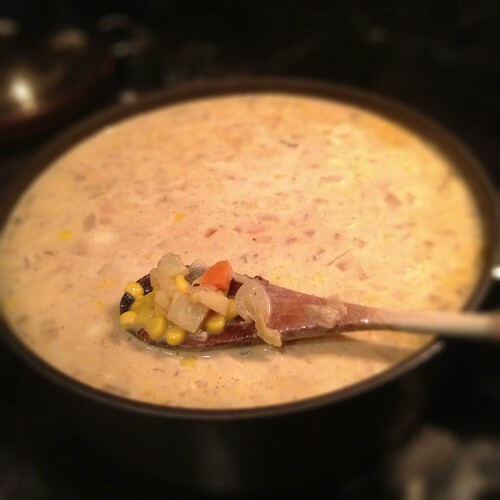 Home » Cooking » Chowdah! It’s what’s for Dinnah! Chowdah! It’s what’s for Dinnah! In a large soup pot, brown up your bacon and render out the fat over medium heat. Once crisp, remove the bacon bits and set aside for garnish. Saute onion, carrots, celery and garlic in the rendered bacon fat until softened. Once the onions and celery are translucent, add the potatoes, bay leaf, milk and chicken stock. Simmer 30 minutes or until the potatoes are soft. Add the cod, and corn (including liquid) and cook until fish is opaque and flakes easily. Remove from heat, stir in evaporated milk and season to taste with salt, pepper and hot pepper sauce.